Kalispell City Hall is located at 201 First Avenue East, Kalispell, MT; phone: 406-758-7703. Photo: Charles E. Conrad Mansion, ca. 1895, 313 Sixth Avenue East, Kalispell, MT Listed on the National Register of Historic Places in 1975. Photographed by user:Royalbroil (own work), 2013, [cc-by-3.0 (creativecommons.org/licenses/by/3.0)], via Wikimedia Commons, accessed June, 2015. Prior to 1890 the only access into the Flathead Valley was from the south, via a boat trip across Flathead Lake and up the Flathead River. The Valley was a vast undeveloped wilderness containing a mixture of excellent farmlands, unlimited timber stands, mineral wealth, coal deposits, potential water power and scenic beauty. Two major events led to the development of Kalispell and the Flathead Valley. First, the European immigration of the 1870s and 1880s brought a huge influx of farmers in search of cheap, good western farmland. Hand in hand with this, the Great Northern Railroad brought a new accessible entrance into the Valley. Kalispell really started as Demersville, established in 1887 by Jack Demers just a few miles southeast of present day Kalispell. Demersville was built on the shore of the Flathead River at the head of navigation and flourished as a major distribution center as farmers, ranchers and businessmen poured into the Flathead Valley. The promise of the railroad coming into the valley brought a major boom in 1890 as speculators believed Demersville, being the head of navigation, would make an ideal division point. At its peak the town boasted 72 saloon licenses, residential lots sold for $500 and commercial land was so expensive, buildings were constructed on leased land with lots renting for as much as $100 per month. Fate prevailed though. Two catastrophic fires in mid and late 1891 destroyed several blocks of the young city. During the same time it was announced the Kalispell, just three miles to the north, would be the new railroad division point. A great exodus of buildings and people followed and by the spring of 1892 only a handful of businesses and homes remained in Demersville. The final blow came 15 years later when June high-water shifted the river channel, leaving Demersville the "Head of Navigation" high and dry, one half mile away from the Flathead River. Kalispell, founded on St. Patrick's Day, March 17, 1891, was named by Railroad Baron James J. Hill. The name came from the Pend Dreille Indians and means "Camas" or "the prairie above the lake." Kalispell was established as the railroad division point over the more obvious Columbia Falls, as speculators behind the Columbia Falls Land Company had driven land costs too high in that area. The Kalispell Townsite, in anticipation of the proposed railroad development, was purchased by Northwest Land Company of Moorehead, Minnesota. Platted land sales began in April 1891 with the sales exceeding $100,000 the first day. Building construction began in May and by October when the County Commissioners in Missoula officially recognized the townsite of Kalispell, there were 23 Chinese laundries and four general stores. In 1893 a citywide electrical system and a sewer and water system boasting 57 fire hydrants (a novelty in the west) were constructed. By 1894 Kalispell was established as the new county seat. Activities slowed as droughts and a railroad strike hampered economic growth in the mid-1890s, but because of the vast potential of Kalispell and Flathead County, swarms of young men continued to move into the area. 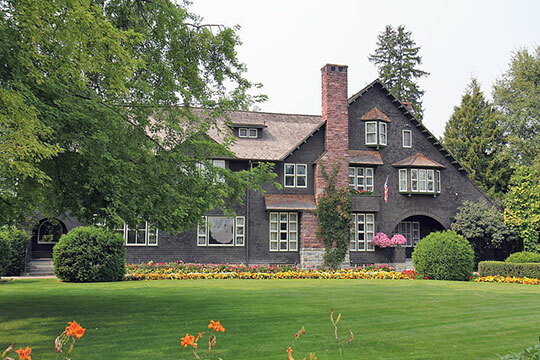 By the year 1900, Kalispell was known throughout the nation for its large number of wealthy bachelors. Men outnumbered women 3 to 1 and there was a chronic scarcity of wives and local school teachers. Despite this temporary social setback, the turn of the century saw new vitality. In 1890 there were 130 houses constructed. In 1900 there were 200 homes constructed, the population stood at 2,500 and farmland prices had risen to $40 per acre. In 1901 over 300 houses were built. Kalispell continued to prosper except for a minor setback in 1904, when the Railroad Division Point and several hundred railroad workers were shifted to Whitefish. By this time, however, Kalispell was entrenched as the commercial, governmental and professional center of the county and areas beyond. Early Kalispell, prompted by its vast riches and potentials, also had it share of grand dreams and schemes. In the 1890s a company was formed to extend the railroad between Kalispell and Missoula, to once again put Kalispell back on the main line railroad. A capitol stock sale of $2,000,000 offered in $100 shares was to make this dream a reality, but in the end, it was just a dream. In 1907, plans were drawn up to dredge a 2-1/2 mile canal to the Flathead River and make Kalispell a river port. It never came to be. In 1911, an elaborate ground breaking ceremony was held and stock was offered for construction of an electric railway system connecting all communities in the valley. Again an overly-ambitious project was yet just a dream. These early promoters of Kalispell were trying to create and capitalize on the boom town growth that they felt should have swept Kalispell. The boom never came. Instead, and in many regards to the betterment of the community, the Kalispell area has experienced stable and continuous growth throughout its existence. Flathead Regional Development Office and the City of Kalispell, Montana, Kalispell City-County Master Plan, 1974, www.kalispell.com, accessed June, 2015.